You are currently browsing the daily archive for February 11, 2019. I regularly participate in an economic survey run by a Munich-based research institute, that tracks how the world economy is doing. The latest results are not good. 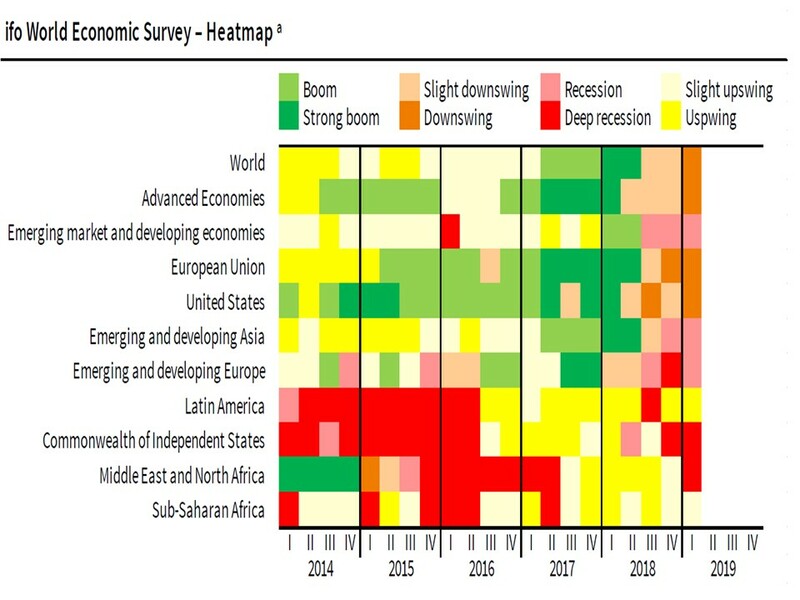 The heat map shown above indicates whether economies are booming green or slowing yellow, orange, light red, dark red. You can see at a glance looking at the ‘heat map’, that the US, Europe and emerging and developing economies in Asia are all slowing. Basically the whole world is slowing down, economically. Why? The US is cooling, as businesses choose not to invest the tax windfall given by the Trump Administration but rather to buy back their shares. China is cooling, owing to the trade war with the US. Europe is cooling, owing to deep uncertainties about Britain, Italy, Hungary and other nations, and a growing spat between France and Italy. In short – look for a global slowdown, that feeds on itself — US demand slows, hurts China, which hurts the Asian economic ecosystem..which in turns slows…. A good time to set aside some savings, for rainy days ahead.